The crater of Vesuvius, before the eruption of 1767. Engraving by Ambroise Tardieu. Photo by David Pyle. Vesuvius – one of the best known volcanoes in the world – has been dormant since its last eruption in 1944. It looms over the sprawling city of Naples, in central Italy, and is watched closely by scientists from the Osservatorio Vesuviano – the world’s oldest volcano observatory. Vesuvius is is one of a handful of volcanoes that run up the western coast of Italy, marking the trace of an ancient subduction zone which is now approaching the end of its geological life. Vesuvius is best known for the devastating eruption of AD 79, which buried the Roman cities of Pompeii and Herculaneum under thick deposits of ash and pumice. 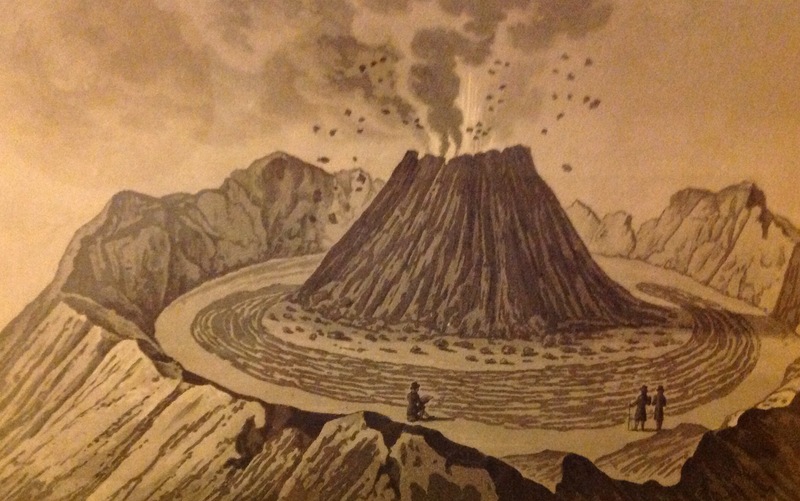 How does Vesuvius stack up as a Top Trumps Volcano? The scores on the cards are based on what we know about the past activity of Vesuvius. These records are very well known back the to 17th century, when the most recent phase of activity began, and more incomplete before then. Explosivity (Volcanic Explosivity Index) – 5. The AD 79 eruption of Vesuvius is the largest known explosive eruption of the volcano of the past 2000 years, and this was an event with an explosivity of 5. There was a violent eruption in December 1631, which was also rated as an explosivity of 5. Height – 1281 m. Vesuvius is not a particularly tall volcano, but the mountain makes a striking backdrop to the city of Naples. Deadliness – 190. Past eruptions of Vesuvius have certainly been destructive, and have led to significant casualties. A repeat of even a moderate-scale explosive eruption, like that of 1631, could be highly damaging to the modern city. Wow factor – 82. A landmark volcano, which is easily accessible and has a summit crater that you climb around and peer into. No wonder our judges thought this had the Wow! factor. Unpredictability – 49. Vesuvius is a dangerous volcano, which is currently in remission. From what we know of its patterns of activity, it tends to go through long periods of quiet with no eruptions (like the period since 1944); but then moves quickly into periods with frequent eruptions, like that from 1631 – 1944. These active periods appear to start with larger explosive eruptions, before settling in to a pattern of smaller eruptions, and for this reason the unpredictability is quite high, even though the volcano is very well monitored. Devastation Potential – 648. This is a large volcano with a history of damaging eruptions next to one of the larger cities in Italy, so the devastation potential is high. The Smithsonian Institution’s Global Volcanism Programme is always the first place to start if you are looking for technical information on volcanoes and their eruptions (www.volcano.si.edu) – here is their Vesuvius page. The British Museum had an exhibition in 2013 on Life and death in Pompeii and Herculaneum.